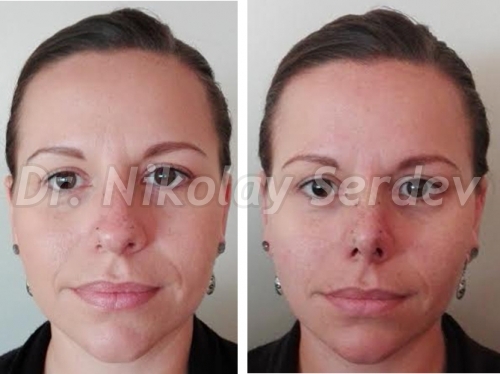 The purpose of rhinoplasty (also known as nose correction, nose reshaping, or simply nose job) is to create correct aesthetic proportions of the nose and face. 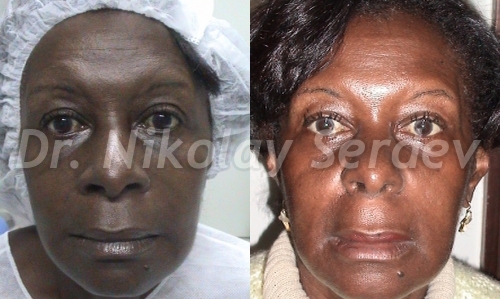 It is the most frequently requested cosmetic surgery procedure for face beautification. In 1/3 of all cases we only work on the tip of the nose, to reduce it’s length, refine and project it. 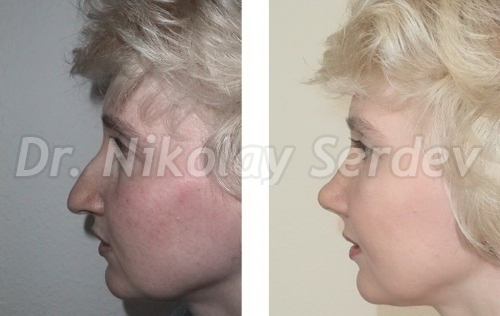 Rhinoplasty requires accurate and precise movements with excellent knowledge of the anatomy. As a central part of the face, the nose has a major role in defining aesthetic proportions. It has an individual structure and has to fit in the overall aesthetic proportions, volume and angles of the face. 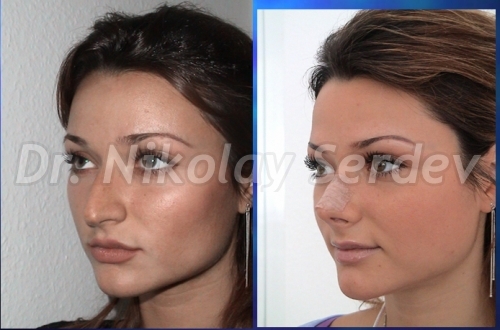 Rhinoplasty can only correct the outer appearance of the nose! If there is an impairment of the nasal function (ex. deviated septum, polyps, deviation of ethmoid bones, mucosal edema etc. 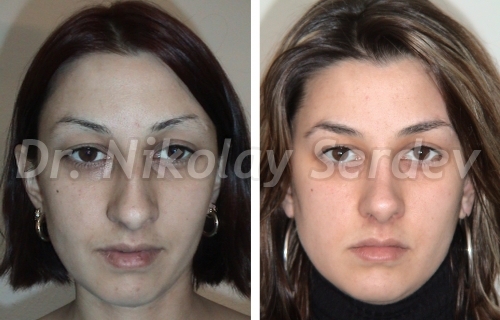 ), we work ENT specialist, when necessary, prior to a cosmetic nose job. A surgeon cannot make your nose like it looks on the face of another person. Your bones, cartilages, skin, individual characteristics and proportions are different!!! 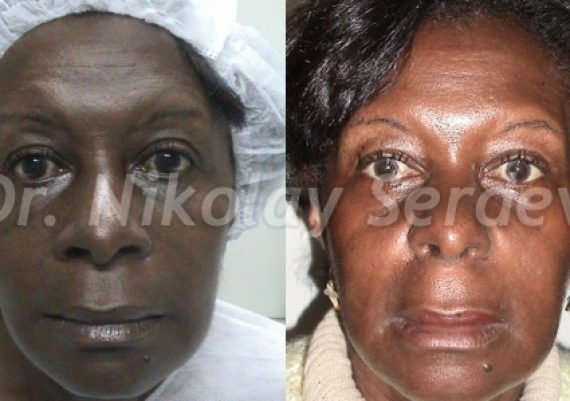 Many patients ask whether Michael Jackson’s nose should be considered as an ideal. Such thinning is impossible without removing bone structures, which disturbs the function of the nose. However, nose’s function is much more important than its appearance! Not everyone can afford to buy and use a hyperbaric oxygen chamber at home to saturate the body with oxygen. 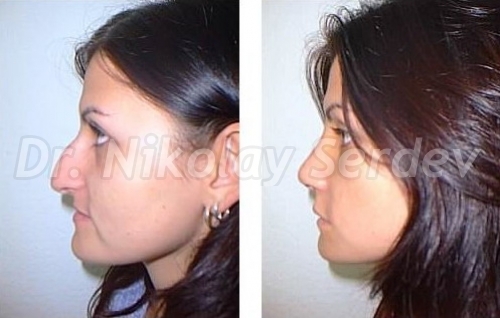 The goal of rhinoplasty is to beautify without disrupting the function! What are the correct proportions of the nose? 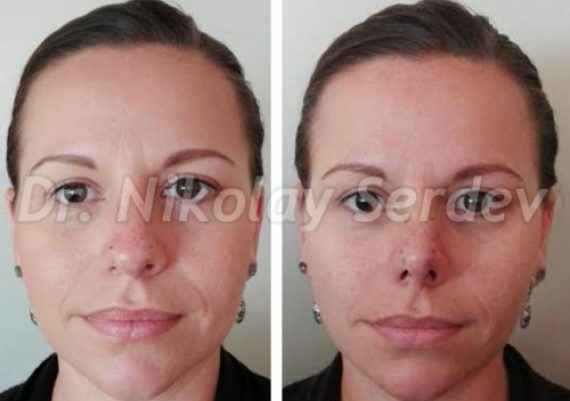 The aesthetic standards for correct proportions of the nose are: 1/3 the length of the face (golden section rule), straight or slightly curved dorsal line, 90 degree angle at the tip, possibly thinner dorsum and tip, narrow alar base. 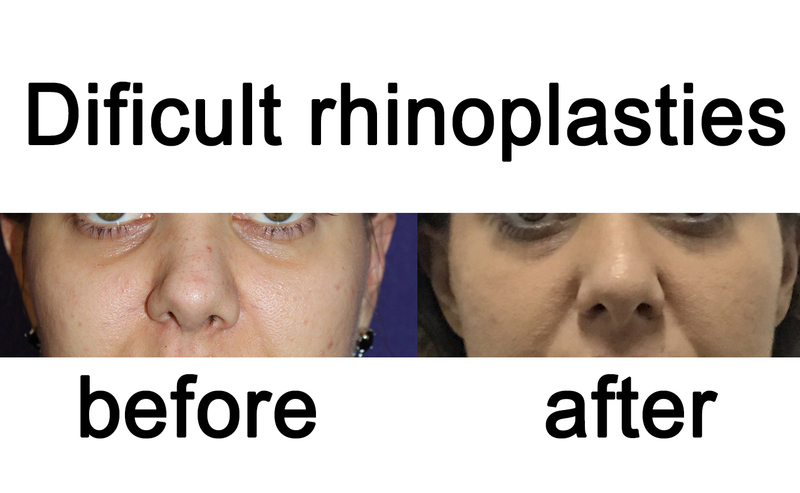 Why do we use Closed, instead of Open Rhinoplasty? 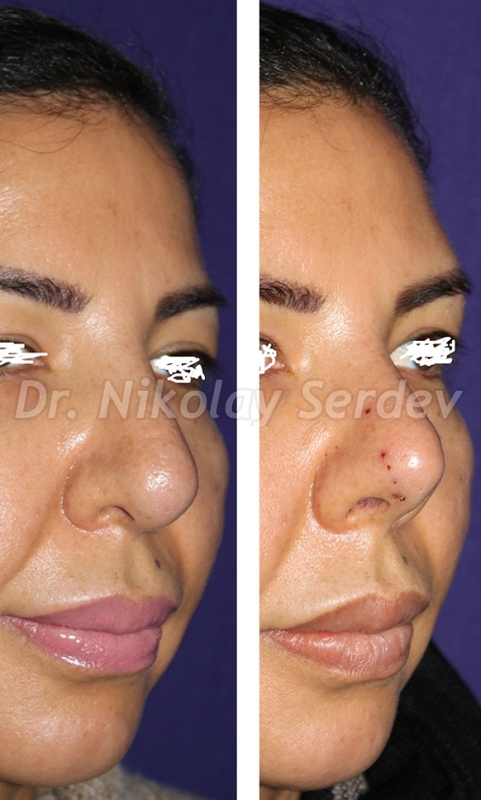 We practice closed rhinoplasty to perform the necessary correction of the nose, and more specifically – Dr. Serdev’s author techniques. 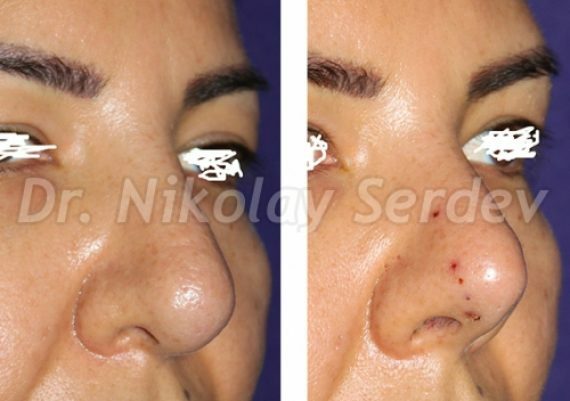 This approach prevents the traumatic “opening” of the nose, it is mini-invasive and without bloodloss. Instead, the manipulation and sutures are made inside the nose. In addition, casts, plasters and intranasal packings become unnecessary. There is no swelling, no “black eyes” and no scars. 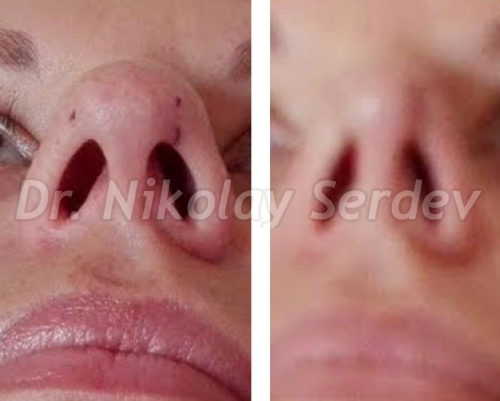 In open rhinoplasty the surgeon would make an incision across the columellar area (the skin-covered barrier between the nostrils) and pulls the skin upward. In this way he can see the cartilages and bone structure of the nose. Then, he reconstructs the cartilage to alter the shape and size of the nose. In the end, the surgeon puts sutures in place to close the incision and inserts intranasal packings for a few days. A cast would be set on the nose for a week so that the new shape stabilizes. The real shape of the nose becomes visible only after one year. However, the scar on the underside of the nose will remain visible. 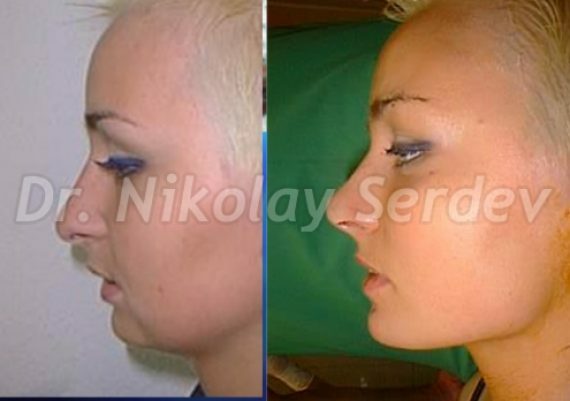 In our clinic we do not like the open rhinoplasty, due to a lot of negatives (loss or necrosis of cartilage, great percentage of secondary corrections, etc.) and visible scars. 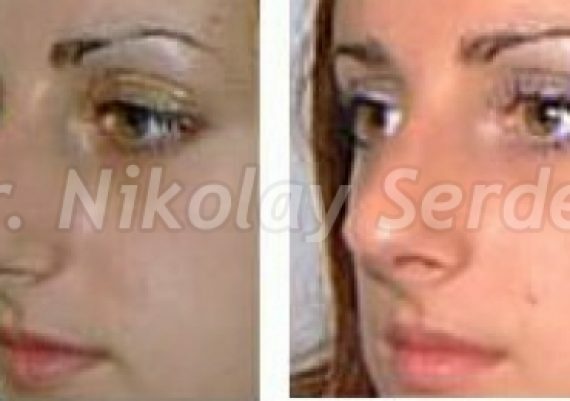 Therefore, we use closed rhinoplasty techniques, without visible scars. Narrowing of the middle third of the nasal dorsum. Regrowth of hump fibrotic tissue, growth cysts or bone spikes (osteophytes, exostoses) from the medial osteotomy area. 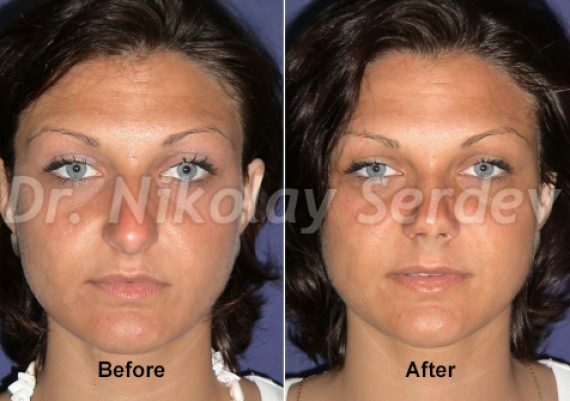 The asthetic correction of the nose is one of the most tolerable procedures for our patients. 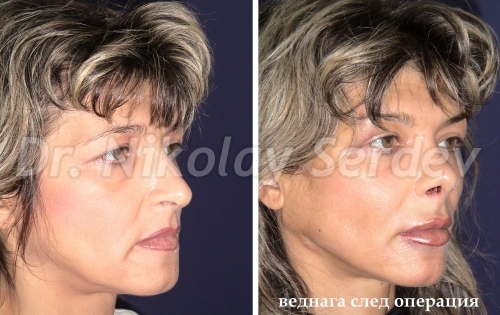 This is because most of the stages of the operation are Dr. Serdev's author techiques in rhinoplasty. 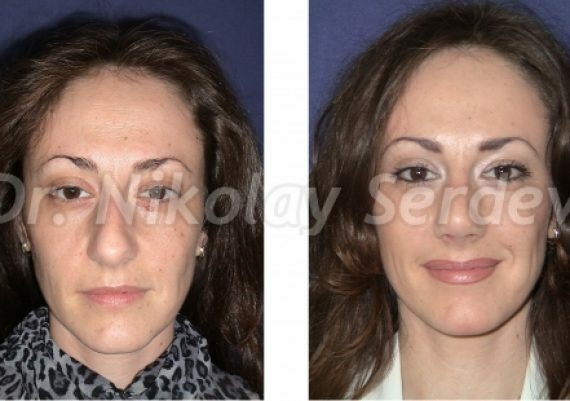 Nose correction in our clinic is an outpatient procedure with local anesthesia, combined with IV sedation. Rhinoplasty is relatively short at his hands but can last for hours with other surgeons, which causes too much trauma to the tissues. Due to the minimal trauma in our operations, a minimal stripe bruise can appear linearly under the eyes in only about 30% of cases of hump removal but it only runs for about 5 days. After the operation and only after humpectomy, the patient wears skin-color tape for three days. 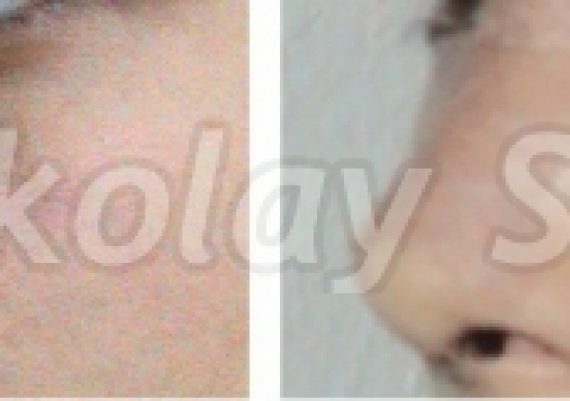 Intranasal packing is not necessary (and even traumatic) because it is placed in the inner nose, while cosmetic corrections deal with the external nose. Full return to social life is possible from the first day due to the lack of bruises. Only in cases of humpectomy, it may be postponed to the 5th postoperative day. - two weeks after surgery - removing any remaining stitches, if necessary. We do not recommend operations before the legal age. 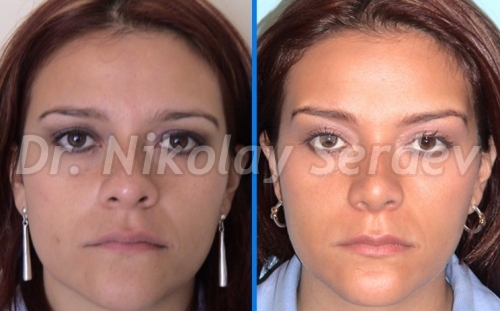 However, in rare cases of severe generated complexes, we can perform rhinoplasty upon request and signatures by both parents. In such cases, minor adjustments could be necessary after the completion of nasal growth, usually bewteen the ages of 18 and 21. 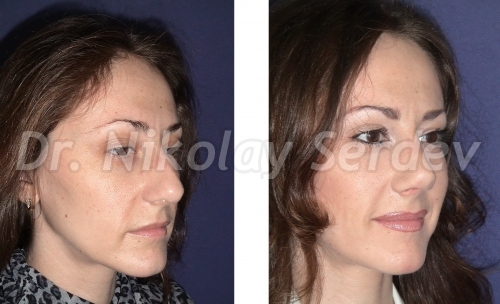 Rhinoplasty is one of the most effective operations. 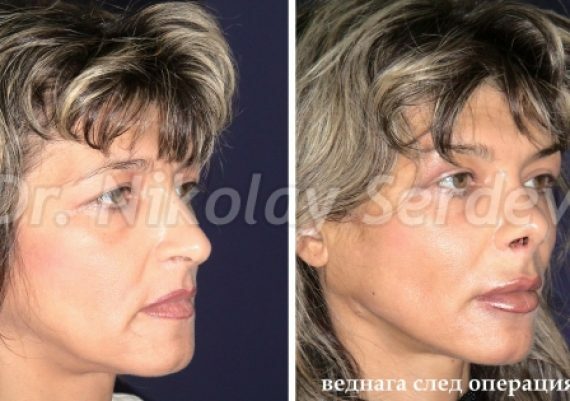 Thanks to the methodology of Prof. Dr. Serdev it is also one of the lightest in cosmetic surgery, with very short recovery period. In some cases patients may wear a tape for only 3 days after surgery. Furthermore, there are no visible signs of intervension - no casts, no intranasal packing and no "black eyes" bruising. 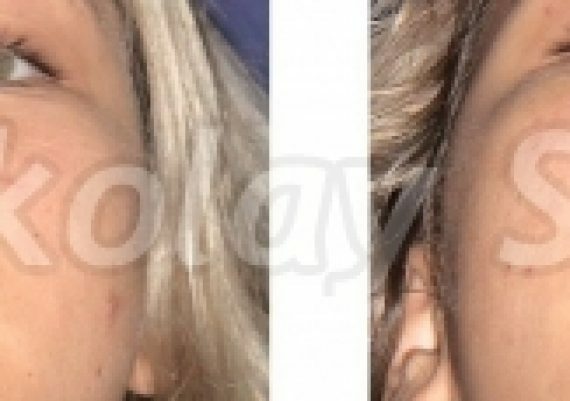 The methodology is based on the achievements of the first president of the American Academy of Cosmetic Surgery - Dr. Julius Newman, surgeon in Hollywood, called "Dr. 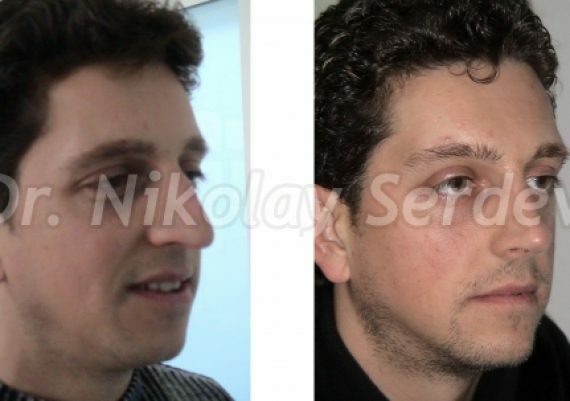 Nose" and improved by Dr. Serdev through basic techniques known in the world as Serdev Tehcniques in Rhinoplasty - "T-zone excision", "columella sliding", as well as the well-known Serdev Suture methods for nasal tip refinement (narrowing) and alar base narrowing. T-excision rotates the tip upwards and the columella sliding gives projection. When we have to correct a hump, we perform a medial resection to the bone-cartilage pyramid. To close the open roof after humpectomy, a very atraumatic methodology exists - the digital fracture - created by Dr. Hernandez from Ecuador. We use it to prevent from bleeding and formation of bone steps on the side of the nose, also known as "crow's feet" . 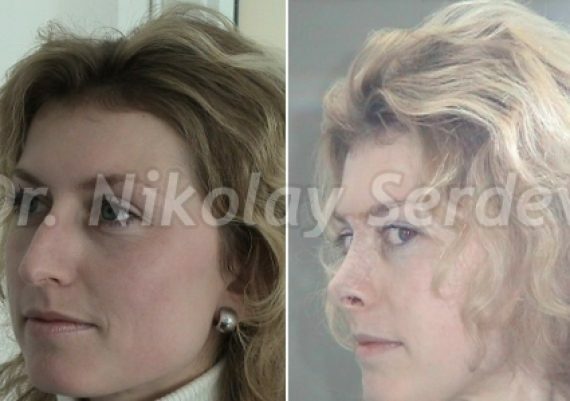 Read more – journal review of the book "Serdev Techniques in Rhinoplasty"
Removing the hump of the nose (nose straightening or humpectomy) requires cutting the convexity of the back (roof) of the nasal bones. 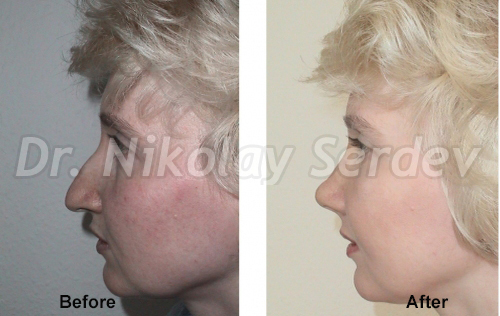 Nasal hump removal aims to create a straight line on the back of the nose. However, removing the hump creates an opening, i.e. the two nasal bones remain separated and must be brought together to form a narrow back of the nose. 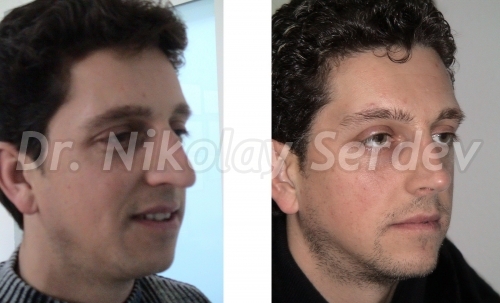 We practice closed rhinoplasty to perform the necessary correction of the nose. This approach prevents the traumatic “opening” of the nose. Instead, we make the manipulation and sutures inside the nose. Due to the minimal trauma in our operations, a minimal stripe bruise can appear under the eyes in only about 30% of cases of hump removal but it only runs for about 5 days. 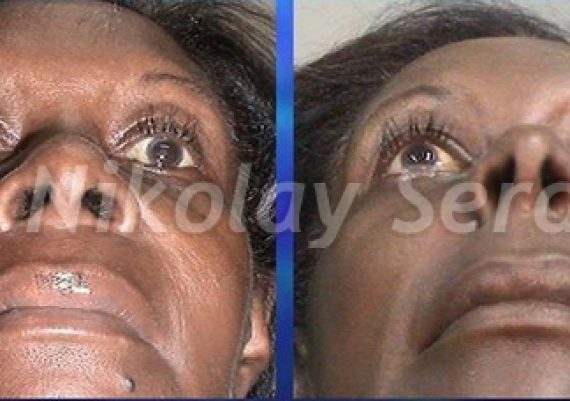 After the operation and only after humpectomy, the patient wears skin-color tape for three days. Intranasal packing is not necessary and is even traumatic. 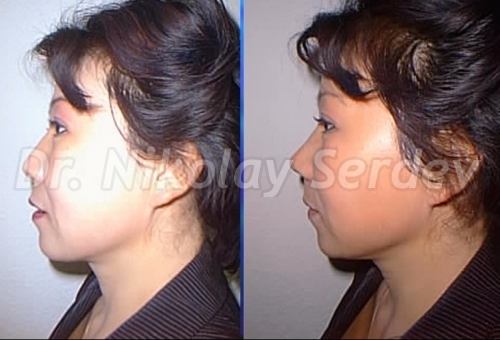 This is because it is placed in the inner nose, while cosmetic corrections deal with the external nose. Full return to social life is possible from the first to the 5th postoperative day, depending on the presence or absence of minor bruises. 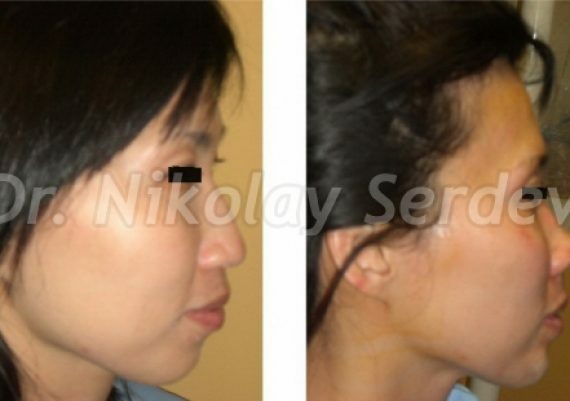 The nasal hump removal can be done as a standalone procedure orin combination with other Serdev techniques for atraumatic nose correction or with complete rhinoplasty. 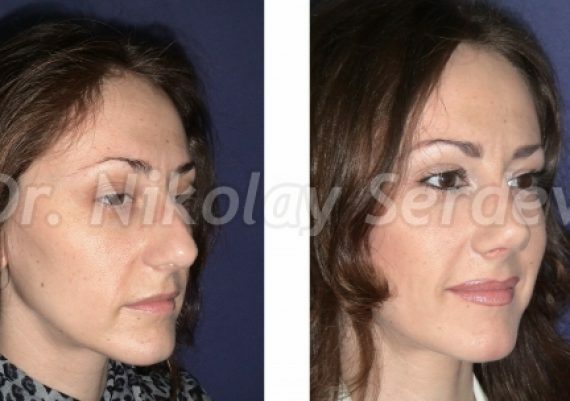 For the purpose of beautification and thanks to the atraumatic nature of the methodology, rhinoplasty can also (if necessary) be combined with different liftings using scarless Serdev Sutures methods or VASER ultrasonic liposculpture on face and body. 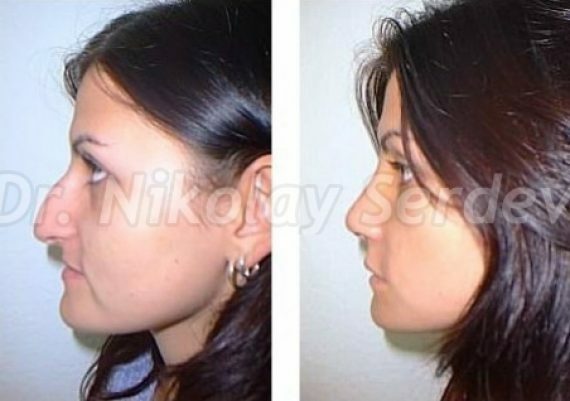 When narrowing the nose, besides working on the tip and the nostrils, we often have to narrow the dorsum (back of the nose) – the upper half (after removing the hump), as well as its lower or middle part. We perform these procedures using Dr. Serdev’s bloodless and atraumatic techniques. This procedure requires closing the open roof of the nasal bones after humpectomy. Removing the “roof” of the nose leaves it open. 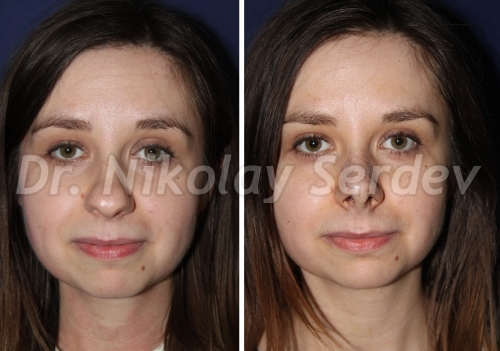 The standard approach for narrowing the nose requires additional lateral osteotomies of the nasal bones on the side of the base and moving the bones inwards. This leads to bleeding and bruising around the eyes (“black eyes”). This method often forms visible “steps” (known as “crow feet”) of the nasal bones in the middle and on both sides. To avoid this malformation, as well as trauma and bruising, Dr. Serdev introduced the technique of digital fracture (breaking) of these bones. This technique leads to their tilting towards each other to close the open “roof” (the back of the nose) and its narrowing without bleeding and trauma. This technique is atraumatic, does not cause soreness and bruising after surgery. In addition, it does not require casts or intranasal packing. The postoperative period is minimal. Minimal bruising can appear in about a third of all cases, in the form of lines on both sides of the nose. Patients tolerate this technique very easily, due to lack of pain. Swelling is minimal. Return to social life is immediate or, in the case of minimal bruises, within a few days. This technique is done by passing the nose either through the mucous membrane (leaving no scars) or through needle punctures of the skin to collect the tissues on the back of the nose. The latter applies also when narrowing the middle part of the nose. The goal is to suture the cartilages on the back of the nose and narrow it. As with every injection, the signs of punctures disappear within 1-2 days. The procedure is bloodless and atraumatic. Patients can resume their daily activities on the day after surgery or rest for a few days if they wish. Narrowing the back of the nose can be done as a standalone procedure, in combination with other Serdev Techniques for Atraumatic Nose Correction or with complete rhinoplasty. 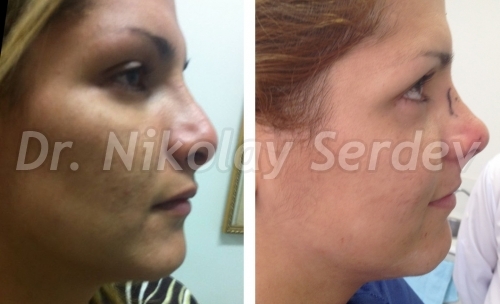 Thanks to the atraumatic nature of the methodology, rhinoplasty may, if necessary, also be combined with different scarless Serdev Sutures lifts or ultrasonic liposculpture of the face. 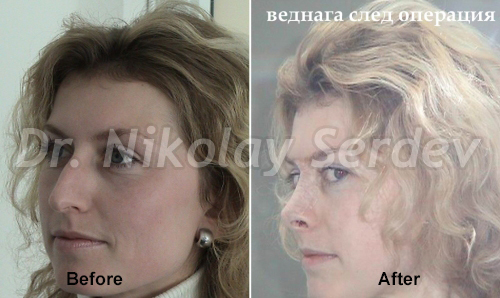 By using Dr. Serdev’s suture techniques, we can also raise the back of the nose or get rid of irregularities. Sutures are performed through skin punctures. The technique is atraumatic and mini-invasive. No patches, casts or intranasal packings are necessary. 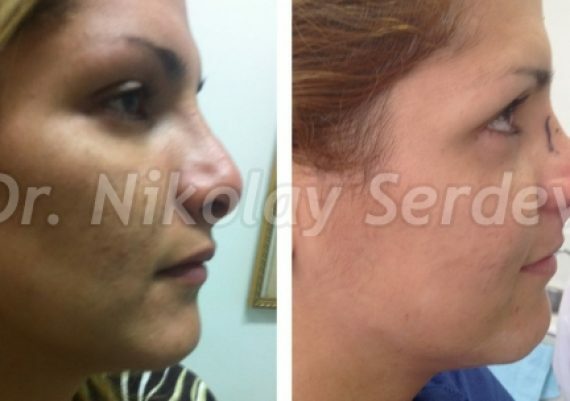 The skin punctures disappear within two days. The nose is positioned in the middle of the face and the aesthetics of proportions essentially depend on it. In at least half of all cases there is no hump and only have to correct the tip of the nose. 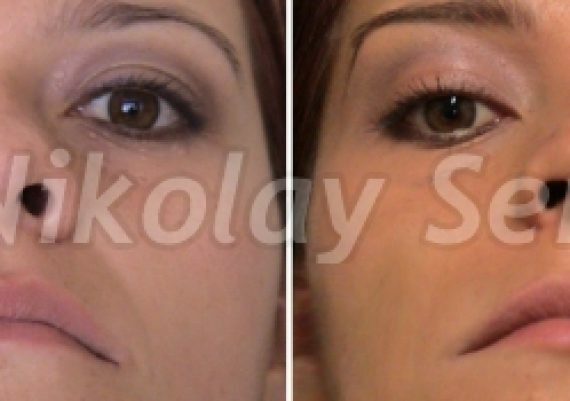 The correction consists of narrowing the tip, shortening (reducing the length of the nose), and projecting it. 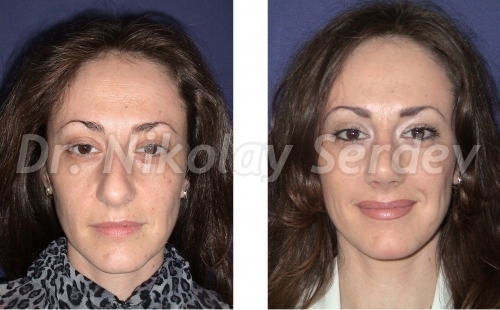 One of the procedures for aesthetic correction of the tip of the nose is its shortening. 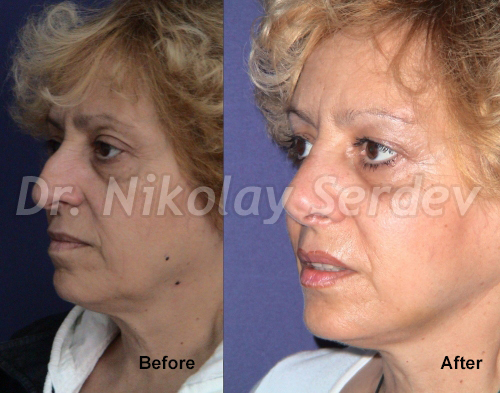 There are two variations of this procedure, both of them created, described and published by Dr. Serdev. They are mini-invasive, atraumatic, without blood loss, without casts and intranasal packings. Due to the lack of scars from surgery, patients can return to work and social life on the day after surgery. Alternatively, they can rest for 1-2 days. T-Excision at the tip: this is an ambulatory, bloodless procedure. 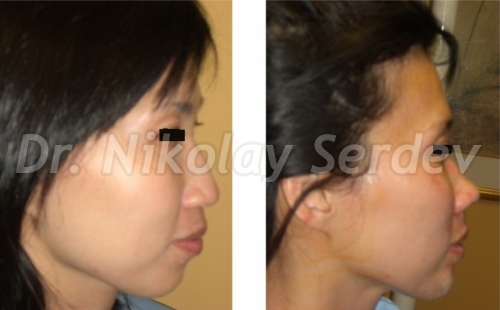 Skin-color tape (as the one used when we remove the hump) and intranasal packings are not necessary. There is no bruising. 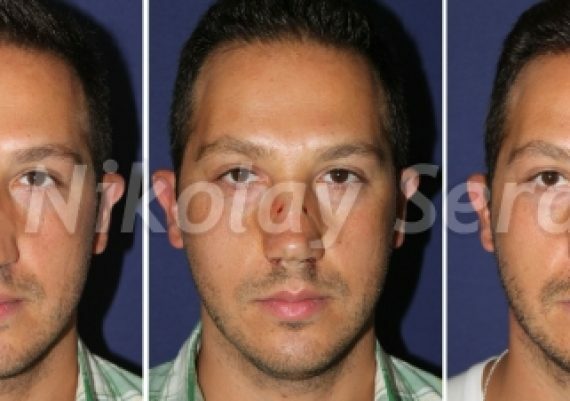 Since we do the procedure using a closed approach and do not open the nose, the postoperative recovery is fast and the swelling is not noticeable. There is no post-op pain except by touch. During the first hours after surgery, there is a slight dripping from the nose, which patients only need to clean gently. We remove the formed crust during the follow-up session on the day after surgery. Breathing is undisturbed, there is no visible scarring and bruising. Patients are free to return to their daily lives without an “operated on” appearance. Suturing the cartilages to the nasal bones, which shortens the nose. It is done using Serdev Sutures method. This method has received worldwide recognition and is being applied worldwide as a mini-invasive and atraumatic technique, without cuts and bleeding. Patients’ return to their daily routines is almost immediate. To our patients, this is a better alternative to classical methods. 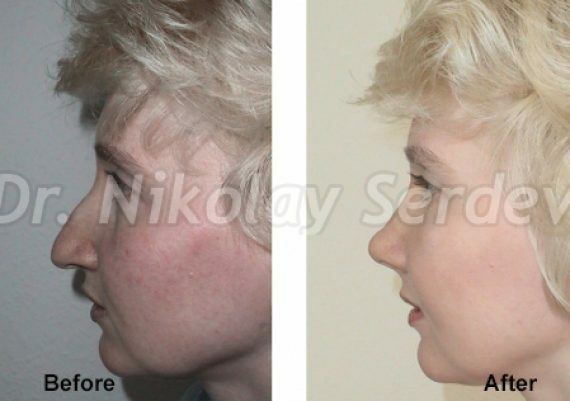 Classic rhinoplasty, especially when opening the nose, reversing the skin with invasive corrections leads to a long postoperative period and long lasting swellings. Results come late and complications are common. Nasal tip projection, according to aesthetics, should be approximately 30o to the facial profile line. In some cases, this angle is larger and the tip protrudes, while in others it is smaller and the nose is low. Both cases present a small deviation from aesthetics. To correct the projections, we apply the columella sliding technique. 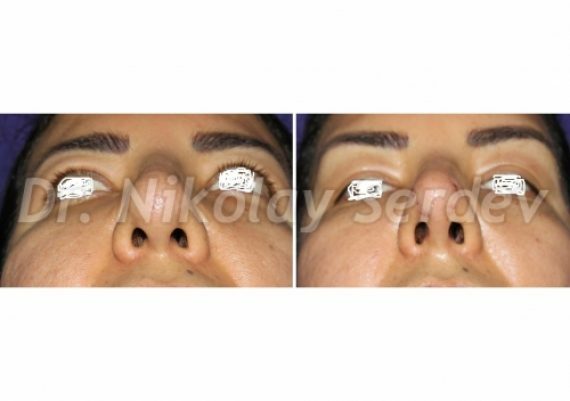 This is a nasal tip correction method, created by Dr. Serdev. It is a simplified technique for fixation of the skin-cartilaginous part of the columella to the septum (the stable cartilage, which divides the two halves of the nose and provides stability to the tip). We can slide the columella up or down to adjust the projection of the tip. In this way, we achieve the aesthetic angle of the nose to the profile line, described above. We do not use implants or transplants. During the follow-up session on the day after surgery, we clean the nose to remove crusts. Patients can immediately resume their social activities. The intervention is mini-invasive, atraumatic and bloodless. There are no visible signs of surgery and no hospitalisation. This is a suturing (sewing) procedure, which tightens and narrows the cartilage on the tip of the nose. For this purpose we either pass through the mucosa or through needle punctures of the skin (no scars remain in either approach). Like with every injection, puncture traces disappear within 1-2 days. 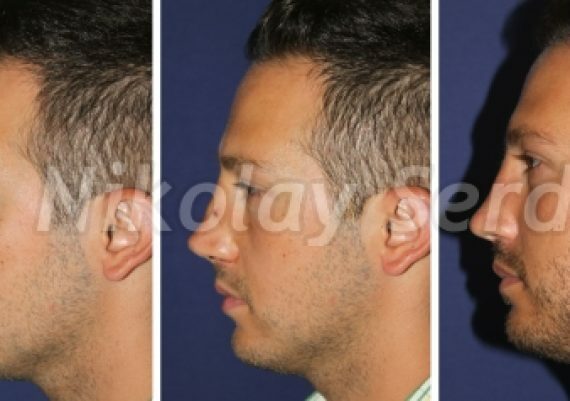 Because we do not open the nose, the procedure for narrowing the nose tip is bloodless and traumatic. There are no plasters or intranasal tamponade. 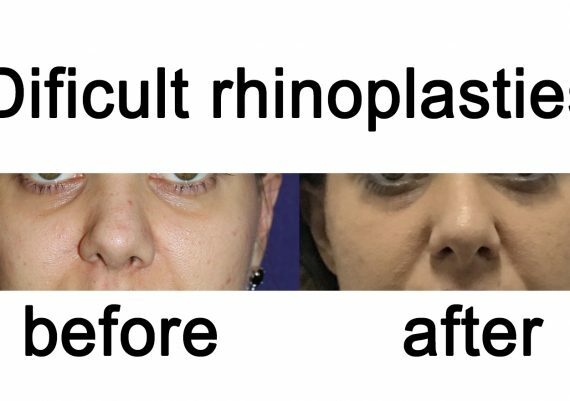 As with all other Serdev techniques, patients can be socially active immediately after their rhinoplasty. 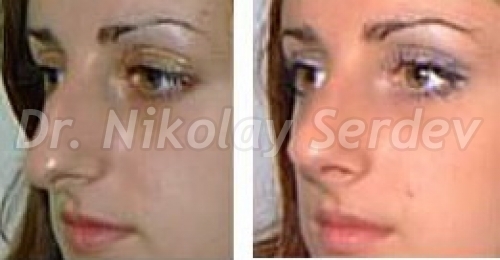 All nasal tip correction procedures – shortening, projection, or narrowing can be performed independently (in the absence of a hump) or in combination with other Serdev rhinoplasty techniques or as parts of complete rhinoplasty. 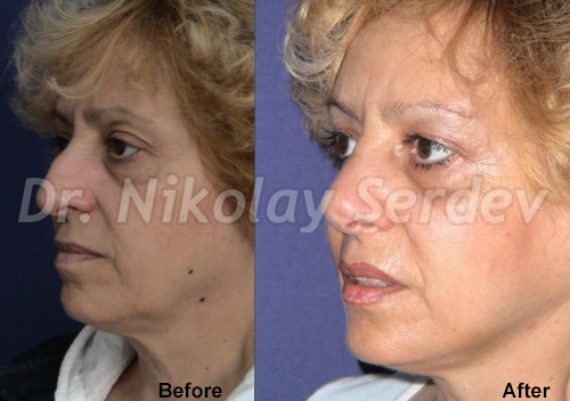 Thanks to the atraumatic nature of these methods, they may be combined with different scarless Serdev Suture lifts or ultrasonic liposculpture of the face. Thanks to Dr Serdev’s author’s techniques in rhinoplasty, we can do non-invasive and atraumatic nostrils narrowing without scars. The nose sits in the middle of the face and aesthetics proportions largely depend on it. Therefore, when narrowing the nostrils we have to take into account the aesthetic 30 degrees deviation of each nostril from the center line. It is important that the correction des not interfere with breathing, because the function of the nose is more important than its shape. 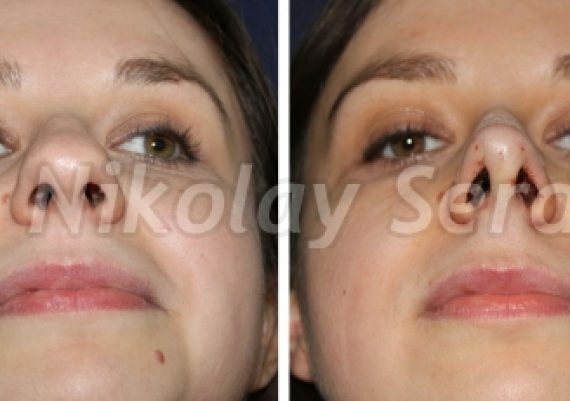 There is also a method for narrowing the nostrils, where the surgeon has to cut off a part of the nostrils. This is an invasive approach and more or less visible scars may remain. This is why we do not recommend this approach and practice it only in select special cases. In addition, cutting the nostrils requires more healing time. 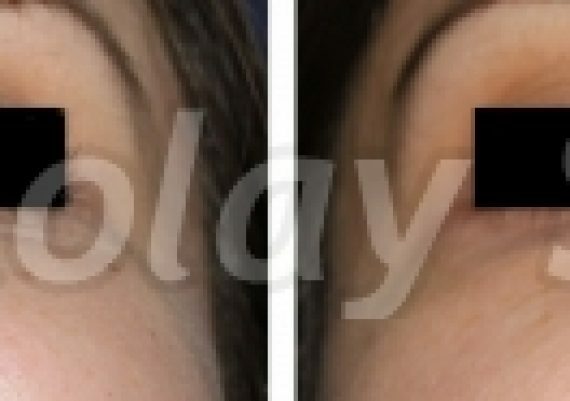 When using Dr. Serdev’s suturing technique, there is no downtime and no visible scars remain. Patients canimmediately resume their daily routines. 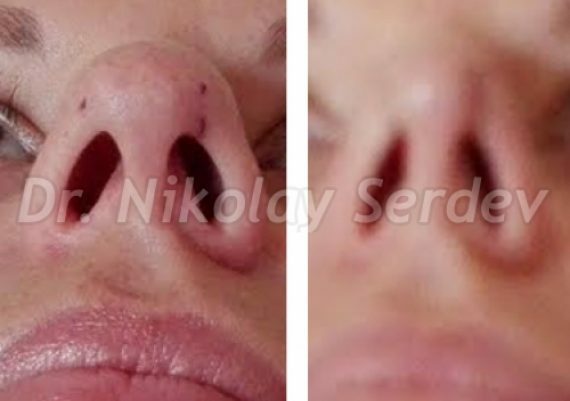 The procedure for narrowing the nostrils can be done as a standalone procedure, in combination with other Serdev Techniques for Atraumatic Nose Correction or with complete rhinoplasty. 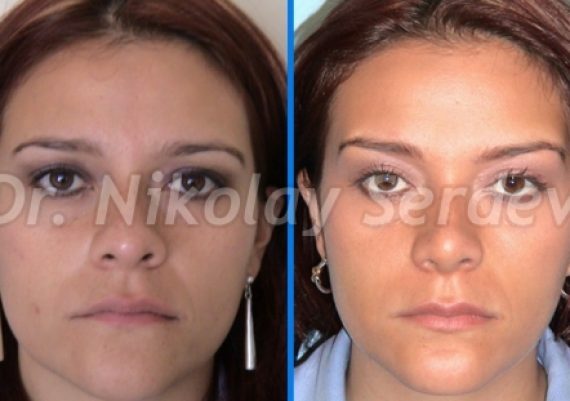 For the purpose of beautification and thanks to the atraumatic nature of the methodology, rhinoplasty can also (if necessary) be combined with different liftings using scarless Serdev Sutures methods or VASER ultrasonic liposculpture on face and body.